Some of the historical points of interest along the way will include the sight of a long railroad trestle bridge built in 1875 by Duane Bliss as part of the Lake Tahoe Railroad line, a brief history of the area beginning in 1860 until the logging industry tailed off in 1901, the remains of a large switchback trestle which was built out from the side of a mountain to allow the trains to reverse direction without the need of a turntable, and much more. The hike is on a dirt road, with a gentle gradient. Be sure to wear appropriate shoes, sunblock and bring a hearty lunch. Duane L. Bliss and H.M. Yerington had great vision when they formed the Carson and Tahoe Lumber and Fluming Company (CTLFC) in 1871. Bliss set out to devour small lumber operations and combine their assets to develop a business large enough to accommodate the Comstock. By 1873, they had acquired 7000 acres of timberland, Spooner’s Ranch, the Summit Fluming Company, and Pray’s operation. An extensive network of wood camps and flume camps and auxiliary mills were placed in strategic locales to construct and maintain an expensive system of flumes and reservoirs, and a labyrinth of haul roads, skid trails and log chutes, along with wagon roads, pack mules, oxen and horses. They were now ready to proceed on Tahoe’s most ambitious lumbering venture. One of CTLFC’s greatest assets was the Summit V-flume they acquired when they bought out the Summit Fluming Company operations. 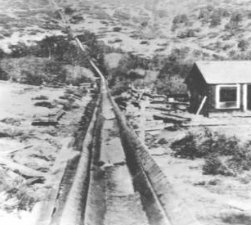 The primary purpose of this flume and its supply reservoir was to stabilize the water supply to float lumber and cordwood down the Clear Creek flume to Carson City. The Marlette Lake to Spooner V-flume ran through North Canyon and was initially constructed in 1870 by the Summit Fluming Company, who also constructed the dam at Marlette Lake. The original Marlette Basin was a meadow containing a small lake at its northwest end. In the late 1860s, the Elliot brothers developed the Marlette Basin by constructing a primitive dam to provide water storage for their Clear Creek [Summit] Flume. By 1871, the lake covered 500 to 600 acres. CTLFC rebuilt the dam with a 24-foot high dam of dirt fill and stone. CTLFC also gave rights to the Virginia City and Gold Hill Water Company (VGHWC) to take water from Marlette in whatever quantity required for a period of 10 years. VGHWC raised the dam in 1875 to 37 feet and to 213 feet long and 16 feet wide. The lake swelled to about 2 miles long and ¾ miles wide and was said to contain 2 billion gallons of water. 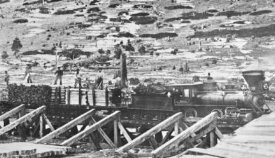 The other asset of the CTLFC was the construction of a narrow gauge railroad to haul logs to Spooner Summit. In 1875, Yerington and Bliss completed construction on the Glenbrook Railroad, also known as the Lake Tahoe Railroad. Construction was difficult over treacherous terrain, and costs of construction reached $30,000 per mile. Forty-five cars and two engines were purchased upon its completion. Costs to operation and maintain the railroad were enormous as well averaging $3000 per month. The Lake Tahoe Railroad rose 910 feet above its namesake. 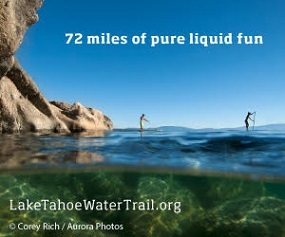 It followed North Canyon Creek out of Glenbrook, wound through the canyon, negotiated several switchbacks, crossed over ten trestles, passed through a 487-foot tunnel, and terminated east of Spooner Summit at the mouth of the Clear Creek Flume. Formal operations consisted of six daily trips to the summit. All cars could hold up to 70 tons of freight up the grade at a speed of about 10 miles per hour (Lindstrom 2001:37).